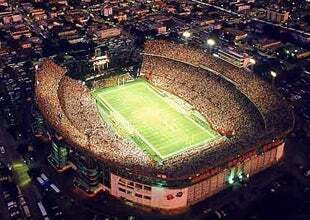 As you know, tonight's Virginia-Miami game marks the end of Orange Bowl Stadium. The Hurricanes will move to Dolphin Stadium next season to begin a planned 25-year stay there, while the Orange Bowl will be blown to smithereens and sold on eBay. Thus, the end. To commemorate the occasion and history, Miami has invited all former players back to form the pregame tunnel for players to run through as they emerge from the locker room. That could look pretty cool. A special halftime ceremony is also planned, and there'll be postgame events as well. And dude ... Jon Secada! So enjoy the moment, and goodbye, sweet Orange Bowl. May stadium heaven be filled with nothing but warm weather and less drunks who piss on you.